Honeysuckle Cottage is part of the Lamellen Estate which has been in the family for generations. It is a semi detached cottage, next door to Rose Cottage and both were originally used for workers of of Kelly Green farm which was once just below the cottages. Recently, new buildings have replaced the old and the farm has been moved away from the river for environmental reasons. The cottage has views up the Allen valley. There is a small garden with patio area, outside furniture and sun loungers, the garden is fenced and secure for dogs. This cosy cottage is surprisingly spacious and luxurious for a couple, with a woodburner housed in an inglenook fireplace, exposed beams, thick walls and a large bedroom with more character features. With excellent access to the A39 all of the delights of the north Cornwall coast are within easy reach, the golden sandy beaches are plentiful from Trebarwith Strand to Newquay and you are thoroughly spoilt for choice. The quaint fishing village of Port Isaac is 10 minutes away and is famed for being an artist's retreat and a film location for the likes of Doc Martin and Poldark. Padstow, and Rock, on the opposite bank of the Camel Estuary, are both well worth a visit and there are a plethora of restaurants to suit all tastes from Michelin starred fine dining to cosy Cornish pubs with great home cooked food. Ground Floor: The front door opens into a small hallway at the foot of the stairs with a door leading into the living room. 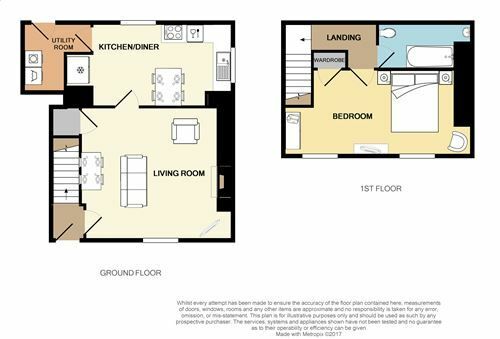 Double aspect, wood burning stove, comfortable sofas and TV, understair storage cupboard and door to kitchen. The kitchen has fully fitted units and a range of appliances, views into the garden. Further door into utility area and external door to garden. First Floor: Stairs lead up to landing with doors to; bedroom with 6' double bed, comfortable chair and storage. Bathroom containing bath with shower over, WC and hand basin. Exterior: There is parking on the drive for at least 2 cars outside of the property. There is an enclosed private garden with grass area and patio with table and chairs, barbecue and sun loungers. The kitchen has a range of units & work tops. There is an electric oven and hob, a microwave, toaster, kettle, dishwasher and an American style fridge freezer. In the utility room there is a washing machine, tumble drier, iron and ironing board. The sitting room has a wood-burning stove and a flat screen digital TV with Freesat & DVD player. WiFi is available at the property. There is a further TV in the bedroom. Electricity, heating, bed linen and towels are included but you will need to provide your own beach towels. Wood is supplied for the wood-burning stove. There is parking available for 2 cars on the drive. Regrettably there is no smoking. A maximum of 2 well behaved dogs may stay in the cottage at a small additional price of £30.00 per dog per week. Please note dogs may not be left unattended in the property and are not permitted upstairs. There is a cot and high chair available on request. Honeysuckle Cottage is situated about a mile from St Tudy a quaint Cornish village, the church around which the village was built was first constructed in the 6th century and then rebuilt in the 11th, 15th and latterly 19th centuries, the village has been built around the original Celtic circular raised graveyard - known locally as "God's Acre!" St Tudy is believed to be the birthplace of Captain Bligh of the "Mutiny on the Bounty" fame! The St Tudy Inn (formerly the Cornish Arms) will welcome you in for a refreshing drink, a hearty meal or both! Guest from Spean Bridge stayed for 5 nights. Guest from Malmesbury stayed for 7 nights. A perfect place to retreat from the Christmas madness, Honeysuckle cottage has absolutely everything you would ever need on holiday, from a well equipped kitchen to a comfy king sized bed, the attention to detail is excellent. Good location for the north coast and close to Wadebridge which has a great selection of shops. Fully enclosed back garden for dogs and parking right at the door too! On the downside, as is the case in many areas of Cornwall, if you want a banging phone signal or super fast broadband this is probably not for you but its the perfect place to relax and recharge - highly recommended. Guest from Newhaven stayed for 14 nights. We chose Honeysuckle Cottage as we wanted a North Cornwall location. We found this was ideal. The cottage was well equipped and we wanted for nothing. The house keeper was very helpful and ensured we were comfortable. The garden was a real bonus as we had our dog with us. The Red Lion Inn in the village served excellent food and is very dog friendly. We love walking so this location was ideal for easy access to both the north coast and the south coast. WE would recommend this cottage to any couple wishing to get away from the daily routine. Guest from Ewhurst stayed for 7 nights. We had a lovely break in the cottage and were welcomed by lovely flowers, wine and milk. The cottage is well appointed and in a lovely location near to the coast and driving distance to most of the Cornwall sites. The garden and patio are really nice but unfortunately for us the weather for most of the week was against us to just sit and listen to the wild life. Maybe one thing that could be improved is the fan in the bathroom that is noisy and stays on for quite sometime, it also need a clean. Also, the instructions for the walk by the River Allen are not very easy to understand and it took us a while to find it and there was no requirement for a key. These two things do not distract from the really nice time we had in the cottage and walks along the beaches and camel trail with our dog Rosie. Lovely cottage with beautiful garden, well located for Padstow and nearby beaches. Very clean and well equipped including outdoor furniture and a BBQ. It was very hot when we were there but unfortunately the noise in the morning from the road next to the cottage meant bedroom windows had to be shut. You can also hear cars on the A39 when sitting in the back garden, although this was easy to tune out. Nearest pub in St Kew Highway is about a mile and a half, but the walk takes you along the main A39 so not really feasible with dogs/ kids. Thank you for taking the time to write a review of Honeysuckle and we're glad you found the cottage clean and well equipped. We're sorry you found the noise from the road annoying, it can be busy and peak times. There is also an excellent pub in St. Tudy which could be walking distance for the energetic! My first stay here. Fresh flowers, wine and milk nice touch (even though I don't drink wine or cows milk) General cleanliness was good although there were several areas where cleaner clearly hadn't touched for a while, namely huge cobwebs (complete with spiders!) in several corners of the cottage. There was a leather fire surround that was thick with dust too but the rest was very clean. Only 2 loo rolls were left which isn't enough for 2 adults for one week, so they need to leave an extra one. Garden was lovely & completely dog proof with nice garden furniture, sun, shade & an outside tap. Cold stone floor in kitchen/utility was great if you have a hot dog ! Location was handy for getting on A39 as only 1 min from St Tudy junction, but the downside of this was you could hear the A39 traffic whilst sat in garden :-( One thing being an animal lover that really upset me though was there was a dairy farm opposite and the day old baby calves that had been separated from their mummies were left alone in a field crying day & night due to their separation. I understand dairy farming but as an animal lover this was quite distressing to see and hear every day, so you might want to consider this if like me, you're easily upset by such things. Also a lot of farm traffic all day so not as quiet as I was expecting and it is for these 2 reasons that can't be changed that I probably won't return, sorry. Two disappointments. It was great to have a six foot bed but unfortunately the mattress was so hard that we left a day early as we both were having trouble with our backs. When we arrived the grass in the garden was really long (could not have been cut for several weeks) so very wet for most of the day. One of the reasons we booked the cottage was because of the large enclosed garden, the grass was cut on the Thursday, the day before we actually left so disappointing although good for the new people coming on Saturday! The garden and pationcould do with a little loving care lots of weeds on and arouind the patio, bushes strangling the lovely azaleas. Will a little bit of work it could be beautiful. Sorry you found the mattress uncomfortable - we have the same mattresses throughout our properties and have not had any complaints before. You were quite right that the garden needed attention - a combination of illness amongst our staff and weather - this has now been seen to and I am sorry it was not up to scratch during your week. I hope this will not put you off visiting us again. Guest from Tadley stayed for 4 nights. Apart from the boiler playing up no really bad points. The bathroom could prove uncomfortable for tall guests with its low sloping ceiling adjacent to washbowl. I'm sorry to hear the boiler played up during your trip. I think Lara, our housekeeper, responded to your issue and had the engineer out. Certainly he has been out since and the boiler is fixed! I'm glad you found Honeysuckle cosy and had a good stay. Guest from Stanford-le-hope stayed for 7 nights. The cottage was everything we hoped for. It was snowing when we arrived and the weather was exceptionally cold, but the cottage was very warm and cosy. Everything you could want was available, and the wine and flowers was a lovely touch. Would certainly return and highly recommend. So pleased you enjoyed your stay and found the cottage warm and cosy in the snow. We will look forward to seeing you again!